MHM Recycling Equipment is among the market leaders in designer, manufacture and suppliers of all types of waste recycling machinery equipment. We run our manufacturing operations from our purpose built premises in Lincolnshire UK and our servicing division operates throughout the UK and Europe. We also have sales and operational offices in Telford, Shropshire. Having offices in both Lincolnshire and Shropshire we can effectively provide UK wide cover for our customers from sales meeting to advising our customers on the best cost effective waste management solutions. 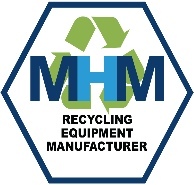 This has allowed us to firmly establish ourselves within the recycling equipment market as, manufactures of high quality recycling machinery and effective waste solution management advisors, coupled with our second to none after sales service and support we offer to our customers, MHM are a one stop shop for quality and service within the waste recycling industry. At MHM Recycling Equipment we are proud of the fact that we are a family run business with all the qualities and personal attention this brings. This has given us a firm foundation to build upon and build upon it we certainly have. MHM Recycling Equipment have grown year on year gaining new valued partners and customers as we do so. MHM Waste Management Solutions started with instant, rapid growth. New sales and operational offices opened in Telford, Shropshire. MHM was appointed as the sole distributor for the UK & Ireland for JOVISA eu brand of fully automatic channel balers. MHM UK Ltd was formed to encompass the ever growing portfolio. MH Metalwork & Engineering Services became a limited company. Evolved to servicing the food industry with onsite maintenance / fabrications / installations. A dedicated Service division was set up to offer support to the demanding and ever growing recycling sector. We began working on projects to design our own Recycling Equipment and offering our services to the recycling sector with an instant impact. Started by Mark Hall as general engineers subcontracting to various manufacturers. MHM Recycling Equipment lead the way in design, manufacture and supply of all types of waste recycling machinery.